I am up at 5:45AM, put my bag out at 6:30AM and have breakfast with the group.The tropical rainstorm lasted all night and only let up as we leave in the boat to board our bus waiting for us at the jetty on the other side of the lake. We have a long day ahead of us, driving over a road that is full of construction and bumps. 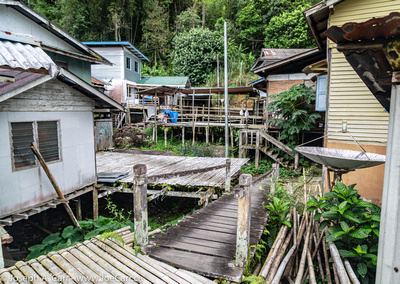 This afternoon, we stop at the Kampung Annah Rais, a Bidayuh longhouse – actually a series of houses strung together with bamboo boardwalks. There are 160 families and about 3,000 people in this community. The place is very quiet, since most residents are at work or away at school. They have a skull house, which contains about a dozen very old skulls from headhunting days long ago. Interesting note from our guide Lemon, although the Bidayuh were headhunters, they were not cannibals. After arriving back in Kuching, we are again staying at the Waterfront Hotel. There is some time for us to explore Kuching on our own in the late afternoon and evening. The hotel is adjacent to the Harmony Arch in old Chinatown, the old courthouse and jail, and the Kuching waterfront on the Sarawak River. This entry was posted in Malaysia and tagged boat, bus, hotel, lake, village. Bookmark the permalink.